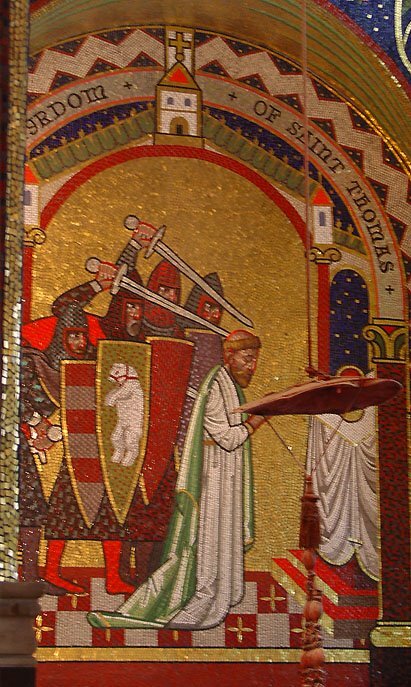 Saint Thomas a Becket, son of an English nobleman, Gilbert Becket, was born on the day consecrated to the memory of Saint Thomas the Apostle, December 21, 1117, in Southwark, England. He was endowed by both nature and grace with gifts recommending him to his fellow men; and his father, certain he would one day be a great servant of Christ, confided his education to a monastery. His first employment was in the government of the London police. There he was obliged to learn the various rights of the Church and of the secular arm, but already he saw so many injustices imposed upon the clergy that he preferred to leave that employment rather than to participate in iniquity. He was perfectly chaste and truthful, and no snares could cause to waver his hatred for any form of covert action. He was employed then by the Archbishop of Canterbury, who sent him on missions to Rome and permitted him to study civil law at the University of Bologna (Italy) for an entire year. After a few years, witnessing his perfect service, he made him his Archdeacon and endowed him with several benefices. The young cleric’s virtue and force soon recommended him also to the king, who made of him his Lord Chancellor. In that high office, while inflexible in the rendition of justice, he was generous and solicitous for the relief of misery. He was severe towards himself, spending the better part of every night in prayer. He often employed a discipline, to be less subject to the revolts of the flesh against the spirit. In a war with France he won the respect of his enemies, including that of the young King Louis VII. To Saint Thomas, his own sovereign, Henry II, confided the education of the crown prince. Of the formation of the future king and the young lords who composed his suite, the Chancellor took extreme care, knowing well that the strength of a State depends largely on the early impressions received by the elite of its youth. When Archbishop Theobald of Canterbury died, the king insisted on the consecration of Saint Thomas in his stead. Saint Thomas at first declined, warning the king that from that hour their friendship would be threatened by his own obligations to uphold the rights of the Church against infringement by the sovereign, whose tendencies were not different from those of his predecessors. In the end he was obliged by obedience to yield. The inevitable conflict was not long in coming. Saint Thomas resisted when the king’s courtiers drew up a list of royal “customs” at Clarendon, where the parliament of the king was assembled, and Henry obliged all the bishops as well as the lords to sign a promise to uphold these without permitting any restrictions whatsoever. Many of these pretended “customs” violated the liberties of the Church, and some were even invented for the occasion. Saint Thomas, obliged in conscience to resist, was soon the object of persecution, not only from the irritated king but by all who had sworn loyalty to his nefarious doings. Saint Thomas took refuge in France under the protection of the generous Louis VII, who resisted successfully the repeated efforts of Henry to turn away his favor from the Archbishop. The Pope at that time was in France, and he, too, was besieged by Henry’s emissaries, but knew well how to pacify minds and protect the defender of the Church. Thomas retired to a Benedictine monastery for two years, and when Henry wrote a threatening letter to its abbot, moved to another. After six years, his office restored as the Pope’s apostolic legate, a title which Henry had wrested from him for a time, he returned to England, to preach again and enforce order in his see. He knew well that it was to martyrdom that he was destined; it is related that the Mother of God appeared to him in France to foretell it to him, and that She presented him for that intention with a red chasuble. By this time the persecuted Archbishop’s case was known to all of Christian Europe, which sympathized with him and elicited from King Henry an appearance of conciliation. The actions of the Pope in this conflict make clear what all of history teaches: the lives of the Church’s Saints themselves comprise the history of the world. The humility of Thomas had prompted him, after a moment of weakness he had manifested in a difficult situation, to judge himself unfit for his office and offer his resignation as Archbishop. The Pope did not hesitate a moment in refusing his resignation. He judged with apostolic wisdom that if Thomas should be deprived of his rank for having opposed the unjust pretensions of the English royalty, no bishop would ever dare oppose the impingements of iniquity on the Church’s rights, and the Spouse of Christ would be no longer sustained by marble columns, but by reeds bending in the wind. Grant, we beseech Thee, almighty God, that as the Savior of the world, born on this day, is the Author of our heavenly birth, so He may also be to us the Giver of immortality. Through our Lord Jesus Christ, Who livest and reignest, with God the Father, in the unity of the Holy Ghost, one God For ever and ever. R. Amen.